I hope your having a great Monday. I painted my nails last night and wanted to share with you a recent color I picked up. I've been eyeing this color for a little while now, but being white I didn't think it would look nice. Some whites are kind of tacky and look like you put whiteout on your nails therefore, I figured all whites were kind of blah. Honestly I really like the way it looks, and I'm happy I got it to add to my collection. 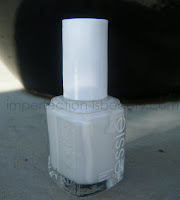 Essie Marshmallow is a gorgeous milky white color. I love this color! I've never wore white nail polish before but this white is gorgeous. Its not very opaque so I did have to do about 3 coats. I added a little glitter to my ring finger to add a pop to them. I think this color would look great on any skin tone, for any season.